An integrated system is more than gear, it's the result of a collaborative process with a partner you can trust. You need a partner who can translate your vision and dreams for ministry into a plan for how technology can help get there. You need a partner who gets what you’re trying to do, and more importantly why you’re trying to do it. You need a partner who will have your back throughout the often complex process of a new build or renovation. You need a partner who has a track record of delivering on time and on budget. We are deeply committed to the design-build process because having one partner from beginning to end — from vision to reality — is always more efficient and effective. Great design is nothing without quality installation, and a great installation of a poor design is inadequate. Bringing the two together with one great partner makes your project cohesive and efficient from beginning to end. But, most importantly, with one of our highly-experienced Project Leads owning every detail of your systems, you can be sure that the technology will equip you to reach your vision at the end of the project, making your investment count. The Design Phase of your project is all about getting from your ministry vision to a buildable solution. Using our Accelerated Collaborative Design (ACD) workshop, we will define your key objectives and how we can best equip you to reach them. It is a powerful 2-3 day experience which captures your system needs and resource constraints, while targeting your goals. Once your ACD is complete, our team develops modeling, space evaluation, and system schematics based on your needs. The design phase is complete when there is an AVL (audio/video/lighting) incorporated Construction Drawing set, one-line drawings, and an all-inclusive AVL-build budget you believe in and agree with. Once everything is approved, it is time for us to start implementation. In the Build Phase, our project leads coordinate the AVL implementation with your general and electrical contractors, ensuring everything is installed according to specification. Once the dust settles, the best field technicians in the business, known across the country for their install quality, arrive onsite and install your new AVL systems. Our experienced team of professionals ensures all aspects of your system are installed perfectly, down to the labels. A high-quality installation means nothing if the final systems are not optimized well and your team is not trained to use them. 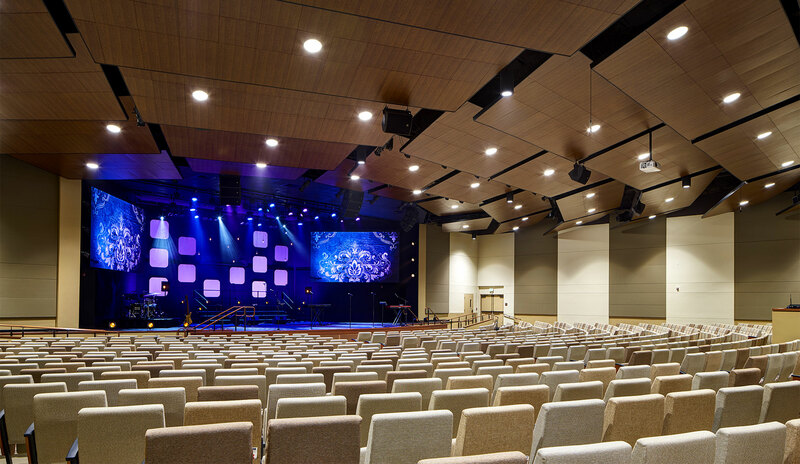 As installation winds down, our Project Leads optimize and train you on your new systems, ensuring your AVL systems work for you to great transformational experiences.